How often do you leave your office worrying that you’ll run into traffic? How often do you check the traffic maps and then become disappointed or angry when you get on the road and see that they were wrong? If you’re interesting in a new approach, TrafficTalk is a “People-Powered Traffic Information Service” which utilizes CB Radio and mobile crowdsourcing to connect you with those in your community who know where the traffic is. TrafficTalk’s voice activation set-up allows for drivers to keep their eyes on the road, thereby making it a safer commute. Aside from being a stress minimizer by eliminating your time spent in traffic, you also get the added benefit of it’s zero price tag. NewVoice Social LLC, the Washington DC based firm behind TrafficTalk, makes it’s money through licensed audio streams, traffic data resale and location-based sponsors or advertisers. So, while you may have to hear a short advertisement before you get your traffic information, you still end up getting a customized route without having to open your wallet. 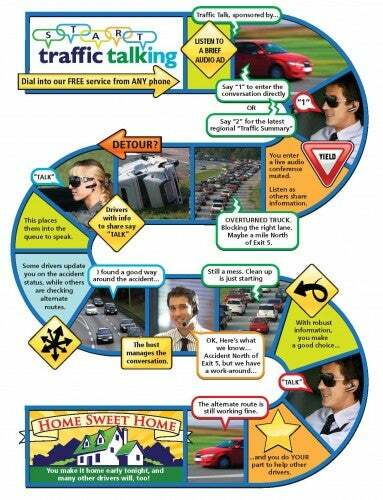 After beta testing in Northern Virginia from 2006-2008 with thousands of users, TrafficTalk is ready to expand. TrafficTalk is now hoping to partner with existing industry players to deploy its patent-pending voice platform nationwide. Two experienced telecom executives, Larry Greenfield and Steve Stern, founded TrafficTalk. Through NewVoice Social LLC they are working “to better reflect the needs of highly mobile communities via social networks.” Come meet the “drivers” behind this potentially nationwide stress-eliminating service at TECH cocktail DC startup mixer on September 29, 2010.